forms and combinations of forms which are encountered at every turn. Indeed, so strongly do these color phenomena appeal to me that I venture to predict that in the not very distant future there may be a color art analogous to the art of sound — a color music, in which the performer, seated before a literally chromatic scale, can play the colors of the spectrum in any succession or combination, flashing on a screen all possible gradations of color, simultaneously or in any desired succession, producing at will the most delicate and subtle modulations of light and color, or the most gorgeous and startling contrasts and color chords! 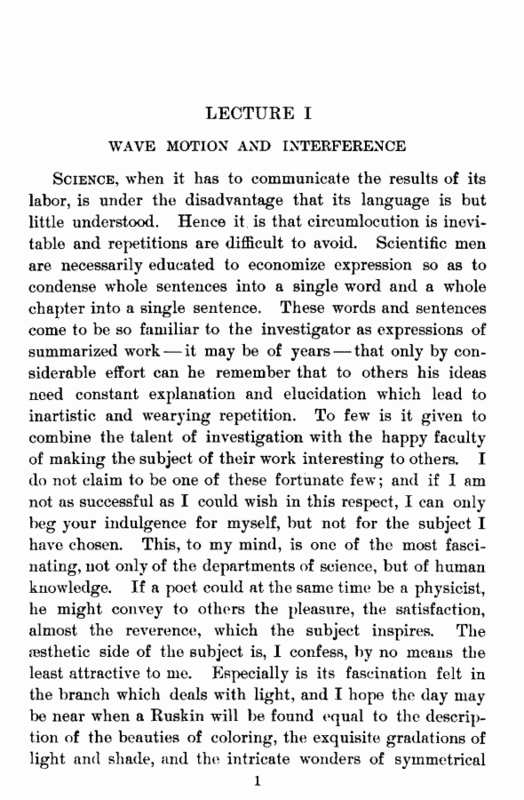 It seems to me that we have here at least as great a possibility of rendering all the fancies, moods, and emotions of the human mind as in the older art. 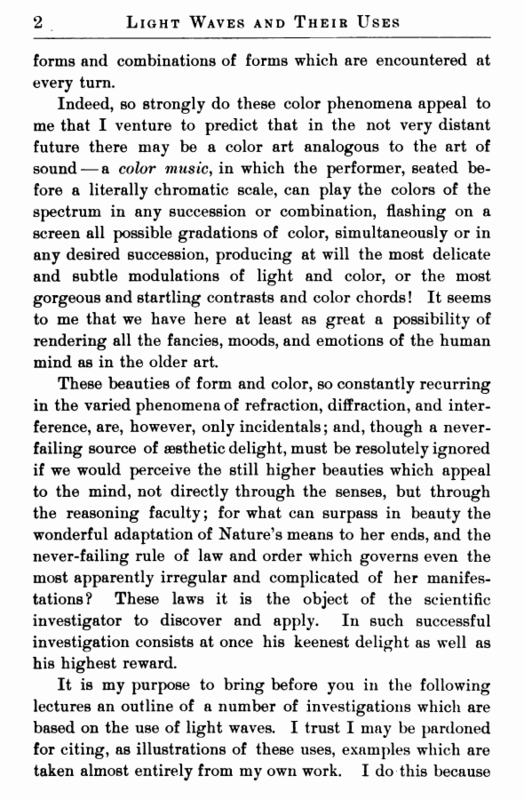 These beauties of form and color, so constantly recurring in the varied phenomena of refraction, diffraction, and interference, are, however, only incidentals; and, though a never-failing source of aesthetic delight, must be resolutely ignored if we would perceive the still higher beauties which appeal to the mind, not directly through the senses, but through the reasoning faculty; for what can surpass in beauty the wonderful adaptation of Nature’s means to her ends, and the never-failing rule of law and order which governs even the most apparently irregular and complicated of her manifestations? These laws it is the object of the scientific investigator to discover and apply. In such successful investigation consists at once his keenest delight as well as his highest reward.